Do you have an employee at risk of losing their job due to injury, disability, or health condition? We may be able to help keep them in the role – saving you the expense and hassle of recruiting and training new team members. Our free Work Assist service is designed to support you and your employees to perform in their role. Work Assist can help you avoid the cost of staff turnover. We understand that your staff are your most valuable asset, and that staff turnover can have a major impact on your business. This service is delivered through the Australian Government’s Work Assist service (formerly known as Jobs in Jeopardy). How do I know if my employee is eligible for Work Assist? You, or your employee, don’t have to be already connected with EPIC Assist to access the Work Assist service. How does Work Assist help my employee keep their job? EPIC Assist makes it simple to access the support you and your employee need, and can arrange a number of supports on your behalf. There could be a number of reasons why your employee is having trouble completing their tasks. We will arrange a free workplace assessment to help you better understand what could be interfering with your staff member’s experience at work. We will work with you and your staff member to work out what changes or equipment will help your employee to do their job. Sometimes small changes can be made to someone’s role that make a big difference to their productivity. Through our Work Assist service we can suggest ways you could redesign your employee’s role that will allow them to thrive, while delivering the business results you need. We will work alongside your employee to see what changes they need to thrive at work, and work with you to implement those changes. Occasionally a simple workplace modification is all that is needed to help your employee reach their full potential. Workplace modifications may include anything from physical adjustments, tools or equipment. We can work with your employee to identify their areas of concern, and come up with a solution to address them. These changes are often minimal, and the costs may be covered through the Australian Government’s Employment Assistance Fund (EAF). 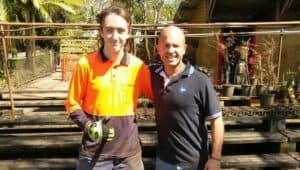 The EAF covers the costs of work-related modifications, equipment, Auslan services, workplace assistance, and support services for people with disability and mental health conditions. Through our Work Assist service we can also connect your employee to other avenues of support such as mental health programs or social groups if they need it.